Mesa, Ariz. (April 2007) ��� Cruise America RV Rental turns 35 this June, but the celebration is starting early at rental locations across the country. For 35 days leading up to the company���s 35th anniversary, customers can receive double the rental time at no extra charge on all weekend and weekly RV rentals. 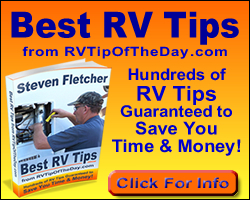 Vacationers who reserve a three-night rental can keep their motorhomes for six nights, while those who reserve a week will receive 14 nights of rental time. This Double-Fun Deal is available on all new reservations for RV travel made between now and April 30. Customers can rent from any of Cruise America���s more than 130 nationwide rental locations, but must depart on one of the 35 days leading up to the company���s anniversary, May 1 through June 4, to receive the promotion. Reservations for the Double-Fun Deal may be made online using hot deal code FRD3 to get up to three free nights after paying for three nights. To receive up to seven free nights after paying for seven, use hot deal code FRD7 or call the reservation center toll-free at 800-671-8042. The FRD3 and FRD7 specials cannot be combined with each other or with any other offer and must be reserved by April 30. The maximum special customers can receive is three free nights with code FRD3 and seven with code FRD7. Cruise America RV rentals are available in compact, standard and large sizes, sleeping from four to seven people and offering a kitchen, bathroom and living area. For vacationers who���d rather drive their own vehicle, Cruise America also offers camping trailers for rent, as well as RV sales at locations across the US and Canada. Founded in Florida in 1972 and now based in Mesa, Ariz., Cruise America is the largest RV rental company in the US, employing around 300 full-time employees in the US and Canada during peak seasons. Family-owned and operated, Cruise America was founded by Robert Smalley, Sr., and is now led by his sons, CEO Randall Smalley and President Robert Smalley, Jr. Visit Cruise America online (www.cruiseamerica.com) for more information or to see hot deals on RV rentals and find out about RV jobs.